Microsoft released SCCM 1806 update is available for all SCCM environment via SLOW ring now. SCCM 1806 is an in-console update for SCCM 1706, 1710, or 1802 production versions of SCCM. We will discuss more SCCM infra upgrade process in this post. More details about SCCM 1806 GA slow ring is in the below blog post. Video experience of SCCM 1806 update is available here. Opt-in PowerShell script download link is here. Difference between SCCM Fast Ring vs. Slow Ring? How to Download SCCM 1806 Production Version? Fix – SCCM 1806 Download Stuck Issues? There are many new features in the 1806 version of SCCM. I will have a separate video post to explain the new features of SCCM 1806. 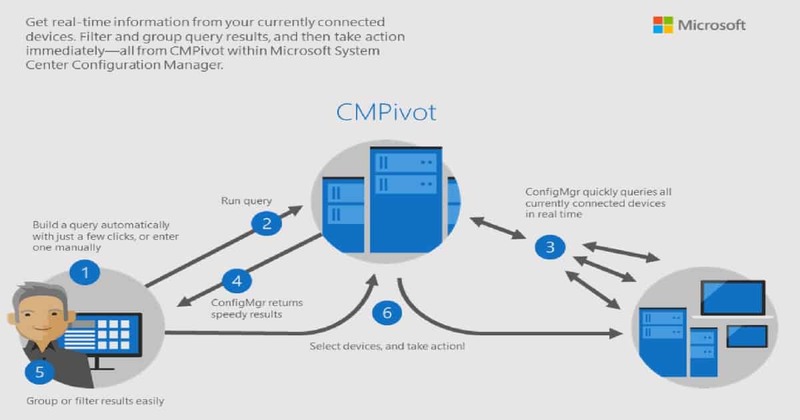 CMPivot and Site server high availability are my favourite ones. From this release, we can have SCCM Primary server in PASSIVE and Active mode. That is a WOW moment for SCCM admins and architects. I have posted about CMPivot video experience (Need to know your current compliance state in real-time?). I would recommend reading that for more information. More information about SCCM 1806 is available in the Microsoft blog post here. Send product feedback directly to Microsoft’s SCCM product team with smileys. More details here. Both fast and slow ring is part of the production version of SCCM. Fast ring version of SCCM is the option given to SCCM admins to get the newest version of SCCM using an opt-in PowerShell script. You will see this update in the console only when you run PS script. If you don’t run the PS script then, there won’t be any update available on your SCCM console. SCCM Slow ring is the general release of the latest version of SCCM for all the customers. Once Microsoft releases the latest production version in the slow ring all the applicable SCCM version infra will get the in-console updates. In this case, SCCM 1806 version will be available only for the SCCM versions 1706, 1710, or 1802. Run the PowerShell script if you are part of slow ring version of SCCM 1806. And also confirm whether SCCM Service Connection Point is ONLINE. 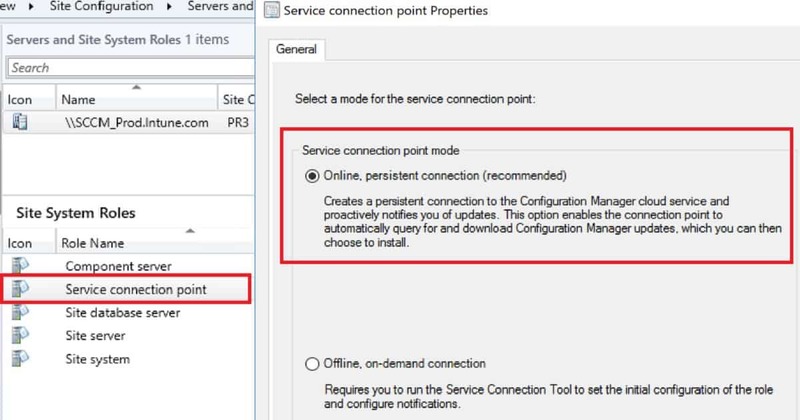 SCCM update will be available in-console only when your service connection point is in ONLINE mode. SCCM 1806 will automatically get downloaded, and no action required. When service connection point is OFFLINE, SCCM won’t be able to download the content from Microsoft. I would recommend reading Microsoft doc to get more details about offline SCCM service connection point. Action required to download 1806 version of SCCM. SCCM infra upgrade post will give more information about the process which you need to follow to upgrade your existing SCCM environment. Are you still running SCCM 2012 and upgrade your SCCM infra into SCCM CB 1806? OK, that is possible. You have to upgrade to the latest baseline version from SCCM 2012. 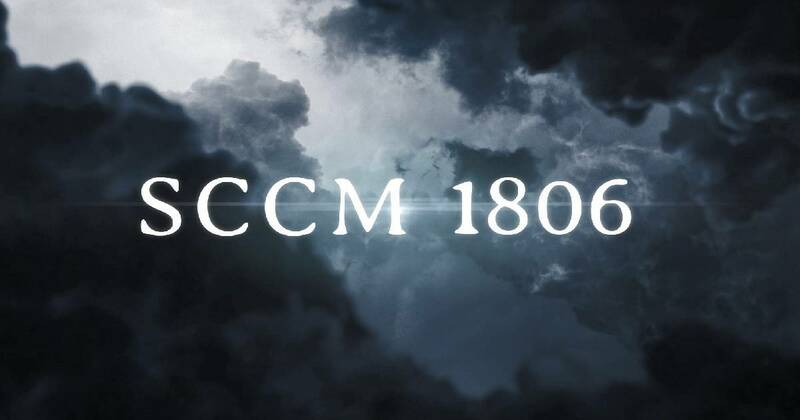 The latest baseline version of SCCM CB is 1802. Once you are in SCCM 1802, you can update your SCCM version to 1806 via in-console update. SCCM 1806 in console version will be available only for the SCCM versions 1706, 1710, or 1802. I would recommend reading Microsoft doc to get more details. Following are the five (5) high-level processes happens in the background when the SCCM updates will get downloaded to your server. I have seen most of the time 1-3 steps will get completed successfully. Download of redistributable files of SCCM is handled by a different SCCM component. This download redist issues can be tracked via ConfigMgrSetup.log. I would recommend reading my previous post on fixing SCCM infra download issues. Do you have problems with 1-3 steps while download the SCCM updates? I would recommend to go through CMUpdateReset.exe tool post. SCCM infra upgrade post will give more details about the process which you need to follow to upgrade your existing SCCM environment. I would recommend running SCCM 1806 prerequisite checks of 1806 two(2) days before the upgrade schedule in your production environment. This prerequisite checks will ensure that the source package of 1806 update is replicated to all required site servers (child primary and secondary servers). This schedule can help you to fix prerequisite issues and a backlog of inbox folders etc. More details on prerequisite checks experience is shared via List of SCCM CB Prerequisite Checks via ConfigMgrPrereq.log. SCCM CB prerequisite checks are repeated for different site systems & servers before the start of the SCCM CB upgrade. Following are high-level SCCM prerequisite check category. I would recommend reading the prerequisite and updated checklist of SCCM 1806 before upgrading your SCCM Infra. SCCM infra upgrade post will give more details about the process which you need to follow to upgrade your existing SCCM environment. I hope, you have already gone through before going through the upgrade process. Login to CAS or stand-alone primary server and launch SCCM console. Navigate SCCM console via – Administration > Overview > Cloud Services > Updates and Servicing. Make sure you right click and select “Install Update Pack”. 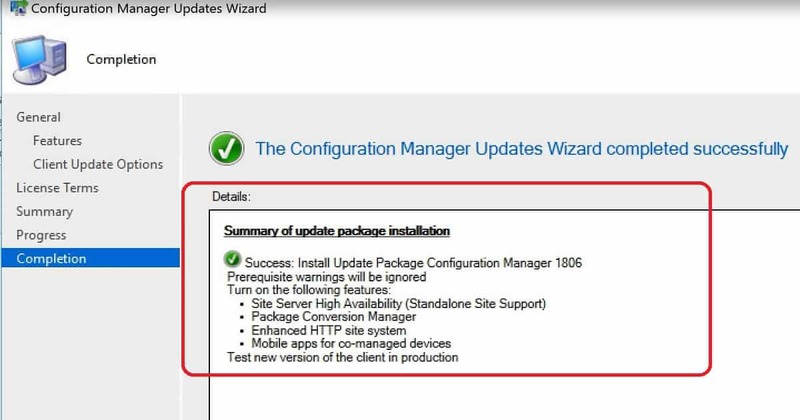 You can go through the Wizard as I shown in the SCCM CB 1806 upgrade video tutorial. But remember to select pilot collection for new client version deployments. 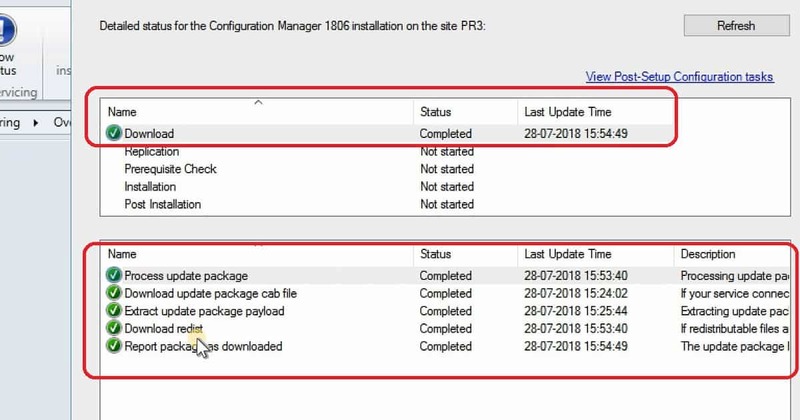 SCCM 1806 production Upgrade process is straight as you can see in the video tutorial for 1806 upgrade. Check the status from the monitoring workspace (\Monitoring\Overview \Updates and Servicing Status\Configuration Manager 1806) and the logs. When you have some problem with the download of SCCM CB 1806 production update then, refer to my previous troubleshooting guide. The SCCM Upgrade usually is super easy but in case. Fix to SCCM CB update Redist Download Issue. I have explained about client upgrade process in the previous blog post. I recommend reading that blog post to get best recommended way to upgrade SCCM client version to 1806. Thanks for sharing the video + new feature details. Just started home lab CB1802 upgrade to CB1806 on CAS. After that will complete PRI & SEC. I believe PRI & SEC can be upgraded directly from CAS console. Will update later my findings for PRI & SEC. Will document the process as well for others, if needed. 2. The primary site got upgraded to CB1806 automatically. 3. For secondary site you can perform from CAS or PRI console. When you select Secondary site you will see an option called UPGRADE. That will take care of secondary site upgrade to CB1806. Pretty easy.